Preheat the oven to 180°C/gas 4. Butter an 18cm diameter round cake tin, or a 1kg loaf tin, and line with greaseproof paper. Sieve the flour and baking powder together. Cream the butter and sugar together until light and fluffy, then beat in the eggs one at a time, adding 1 tsp of flour with each egg to prevent the mix curdling. When the eggs are well incorporated, gently stir in the rest of the flour. Then stir in the milk mixed with the vanilla extract. Stir in the caraway seeds, mixing lightly. Spoon into the prepared tin and bake for 50 minutes, or until a skewer inserted into the cake comes out clean. Leave to cool in the tin for 10 minutes then turn out on to a wire rack to cool. 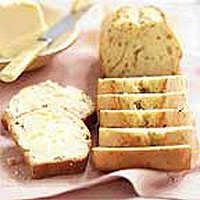 Serve in wedges or slices, spread with plenty of butter. This cake will keep in an airtight container for up to 3 days.